This purpose of this project is to compare players by attributes in the Fifa 18 video game. The full interactive visualization can be seen here. The code below demonstrates how I prepared and cleaned the Fifa 18 data. Code written in R.
The Fifa 18 players database is available through Kaggle, and includes almost 18,000 players with 185 fields for each player including about 36 player attributes, such as finishing and crossing. # How many rows contain NA values? # Which columns contain NA values? # Now how many rows contain NA values? # Investigate columns which contain "prefers", "speciality", and "trait"
It’s possible to compare players across all of these attributes, however I’d like to create a visualization showing each player and their relative distance to each other in terms of similarity. Using principal component analysis (PCA), I compressed the 36 player attributes (plus height and weight) to two components. # Any NA in attributes? 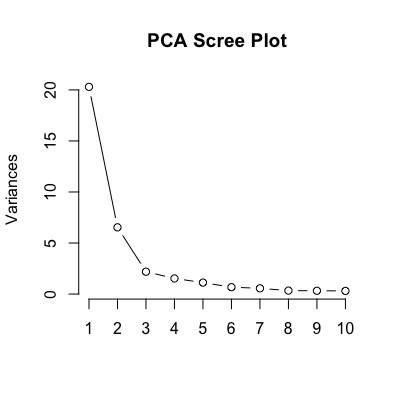 The scree plot below shows that the two components account for 75% of the variance in the 36 player attributes. Ideally, at least 85% of the variance would be retained, but according to the scree plot that would require about four components. For the purposes of visualization, I’ll limit the number of components to two. 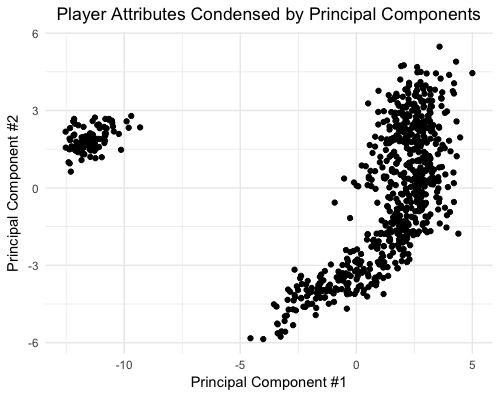 With the player attributes condensed to just two dimensions, its straightforward to create a scatter plot where each point represents a single player. For the plot below and the rest of the analysis, I focus on the top 750 players by overall ranking in the Fifa dataset. It’s clear that there are some groups of players clustered together. It’s likely that goalkeepers form the cluster of players on the left of the scatter plot given that their attributes are so different to outfield players. 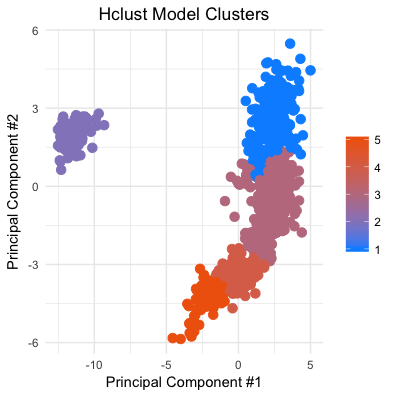 To identify other potential clusters, I utilized both K-Means and Hierarchical Agglomerative (HClust) clustering. As the scree-like plots below indicate, each of the algorithms suggest a different number of clusters (judging by the “elbow” of each plot). 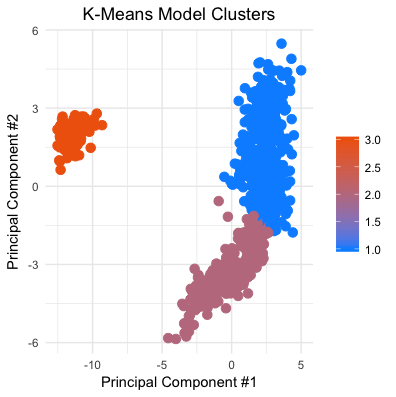 The Hierarchical method suggests four or five clusters, while looking at the within group sum of squares for K-Means suggest three clusters would be optimal. 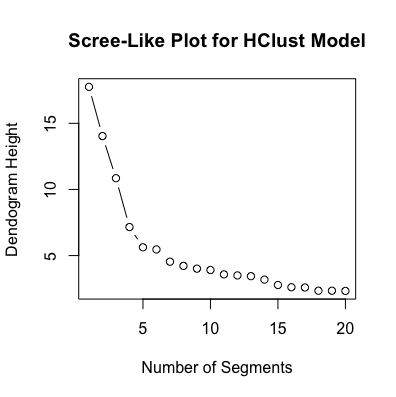 Running each of the HClust and K-Means models on the Fifa players scatterplot shows the differences between the two models. 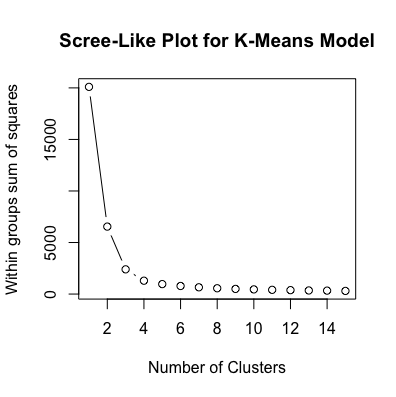 K-Means operates on the assumption of equally proportionate clusters, and this bias shows in the plots below. I used these clusters to identify the player “type”, a more general classification than a player’s position. However, I can take advantage of the player position variable to help “profile” each cluster. As it turns out, the cluster on the far left is indeed composed entirely of goalkeepers. The lowermost cluster is composed almost entirely of center-backs(CBs), with one center defensive midfield (CDM), and two right backs (RBs). This cluster forms the “Defensive Anchor” type. The next cluster moving up the right-hand side, consists mostly of CBs, with some CDMs and central midfielders (CMs). I call this cluster the “Defensive Playmaker” type and includes players like David Luiz and Nemanja Matic. The next pinkish cluster, is the largest cluster and contains a wide mix of defenders, midfielders and forwards. I think of this cluster as a catch-all for players who don’t fall in the other clusters, I use the term “Box to Box Player” to describe this cluster, but it includes players as varying as N’golo Kante and Zlatan Ibrahimovic. Finally, the blue cluster at the top has players such as Neymar and Lionel Messi. I call this cluster the “Out and Out Attacker” type.